Here’s a Thanksgiving bird worthy of starring as the centerpiece on your holiday table. 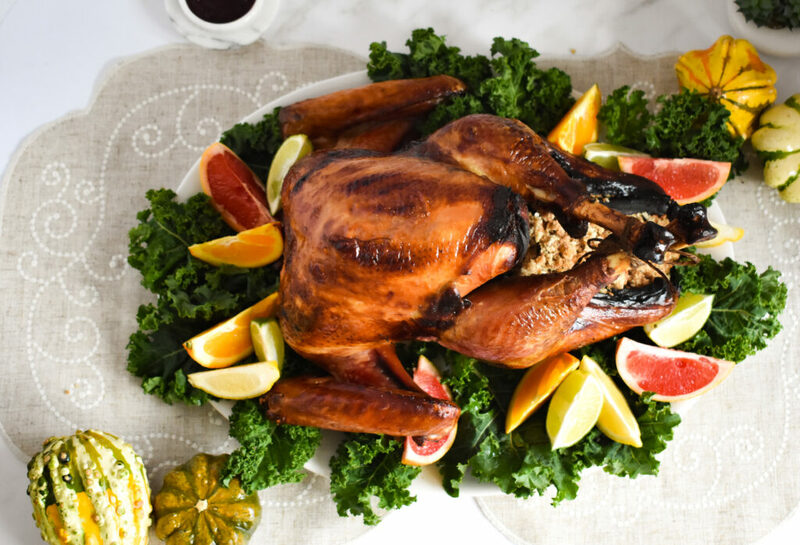 There are countless variations on turkey, and nearly as many opinions as to which is best (to brine? to fry? to spatchcock?). This roast bird gets plenty of flavor from a dry rub of fragrant thyme, sage, and paprika. Butter and high heat make for that perfect crispy skin, and strategic foil keeps the breast meat from drying out. Ask your guests to bring the sides, and serve with Cave de Ribeauville Gewürztraminer or Valley of the Moon Pinot Noir. Dry Rub: 2 teaspoons each of salt, sugar, dried thyme & sage, paprika, pepper & mustard powder. Combine together. Remove the turkey from its packaging. From the bird’s cavity, remove the neck and the bag containing the gizzards and heart. (You can keep these items to make stock or discard them.) Use a few paper towels to dry off the skin of the bird and inside the cavity. Lift the skin over the turkey breast (on the side closest to the legs) and slide your hand under the skin separating it from the breast meat. Do this on both sides of the breast. Insert 3-4 pats of butter under the skin on one side of the turkey breast spreading them around evenly. Repeat on the other side. Sprinkle the dry rub all over the turkey – breast, legs, wings, anything you can see. Using your hands press the rub into the skin a little. If you have any extra rub sprinkle it inside the cavity. Transfer the bird to your roasting pan. Take a good sized piece of foil and place it over the turkey breast. (You want to make sure to the foil piece is big enough to fit over the whole breast.) Place the turkey in the oven and roast for 2 hours. Carefully remove the foil from the turkey. Increase the oven temperature to 400 degrees and cook the turkey for another hour, or until the internal temperature of the breast reaches 165 degrees F and the skin is golden and crispy. At this point fill the cavity with desired stuffing and continue baking for 10 more minutes. Remove the turkey from the oven and let it rest briefly before carving.